MATT VEASEY: Jimmy Rollins Deal to Dodgers in Jeopardy? For a week now, Phillies fans have been waiting impatiently for the conclusion of the trade of a franchise icon, Jimmy Rollins. Now comes news that the deal is completely up in the air, and could conceivably fall through altogether. 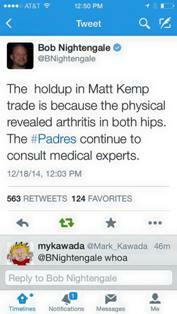 News broke this morning via Twitter, of all places, that Dodgers outfielder Matt Kemp is suffering from arthritis in both hips. The news came in a post from respected USA Today baseball writer Bob Nightengale. The importance of this to the Rollins trade is that LA had a deal in place with the San Diego Padres, swapping Kemp and Tim Federowicz along with $35 million for catcher Yasmani Grandal and a pair of pitching prospects, Joe Wieland and Zach Eflin. Once this deal was complete, the Dodgers were then forwarding Eflin along with their own pitching prospect, Tom Windle, to the Phillies in exchange for Rollins. with the Dodgers-Padres deal teetering on the outcome of doctor evaluations of Kemp’s prospective performance over the next 3-5 years, the Phils-Dodgers deal remains on hold. Jimmy Rollins and Phillies fans remain in limbo. There is a strong belief that no matter what happens with the Dodgers and Padres, Rollins will be dealt to Los Angeles. The Phils and Dodgers would simply work a different 2nd pitching prospect into the deal, possibly either of lefties Zach Lee or Chris Reed, or righty Chris Anderson. For now, the Phillies sit and wait. There is a strong likelihood that there will be a resolution to the LA-SD situation some time today. When there is a final Rollins deal in place and consummated, TBOH will have it for you right here.